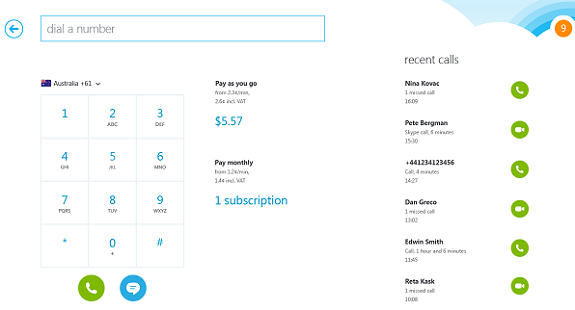 The most popular VOIP client Skype is about to get a major upgrade. Skype for Windows 8 is going to be released on October 26, the same day as the release of Windows 8. This is announced on both the Skype Blog as well as Windows 8 Blog by Microsoft. Skype for Windows 8 is going to be a major upgrade as it will coming with a tight integration of Skype features with Windows 8 operating System. The new release will be using the Modern GUI of Windows 8 and users can read recent chat messages, calls right there as they launch Skype alongside the people that you contact most often. It comes with a new dial pad too if you want to make calls from Skype. It will run in background even if you are running other windows 8 apps on your desktop, laptop, tablet or convertible PC and you can receive voice, video calls & chats. Checkout the video below to see a sneak peek of Skype for Windows 8. 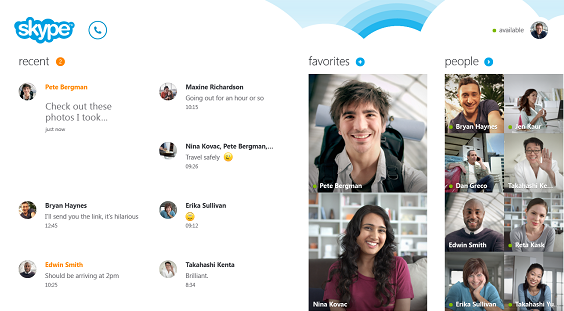 Skype for Windows 8 bring tighter integration with windows 8 People App. All your Skype contacts will show up in the People app of Windows 8 automatically the moment you sign in to skype using a microsoft account.You can connect your Skype account with the People app. If you have skype credit, then you can even call anyone from your People App using skype by calling their mobile or landline number.